Online registration is now closed. Walk-up registrations are welcome at packet pick-up and onsite race day: Packet Pick-up: Friday, May 4 from 10 am - 7 pm Saturday, May 5 from 10 am - 3 pm Sunday, May 6 from 7:30 am - 8:30 am (race begins at 9:00 am) Click on The Run for additional information or go to dgcrunforsight.org. All donations and event proceeds support children with a visual impairment. Online Registration Closes May 1, 2018. Each paid registration will receive a free 2018 T-shirt if the registration is received by the guarantee deadline, April 22,2018. T-shirts are not included in free registrations for 5K/2K Kids 5 and under or Kids Dash. Kids t-shirts can be purchased for $10. Additional t-shirts for participants can be purchased as part of your registration. People unable to participate this year can purchase a t-shirt by clicking on the t-shirt button at the top of the page. Beginning April 23, t-shirts free with registration and additional purchases can no longer be guaranteed. Check at packet pick-up for availability. T-shirts will be provided free for paid registrations or sold on a first come first served basis at packet pick-up and on race day based on availability. Online registration closes May 1, 2018. Participants can register at Packet Pick-up (see details below) and onsite on Race Day. Registered participants can pick up their packets on Friday, May 4, 2018 from 10:00 am - 7:00 pm and Saturday, May 5 from 10:00 am - 3:00 pm at the Delta Gamma Center or on race day, May 6 from 7:30 - 8:30 am at Forest Park Festival Plaza. 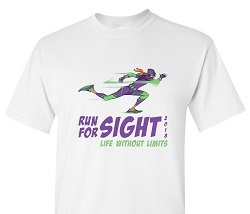 To volunteer for 2018 Superhero Run for Sight please click here. If you have problems with the registration site, please contact service@getmeregistered.com for help. Or you can click on the "Contact the Organizers" button above on the left. When this page loaded, the official time was 7:55:16 AM EDT.